What is a quote status? Who needs to perform a certain action: e.g. the booking is Pending for Owner. 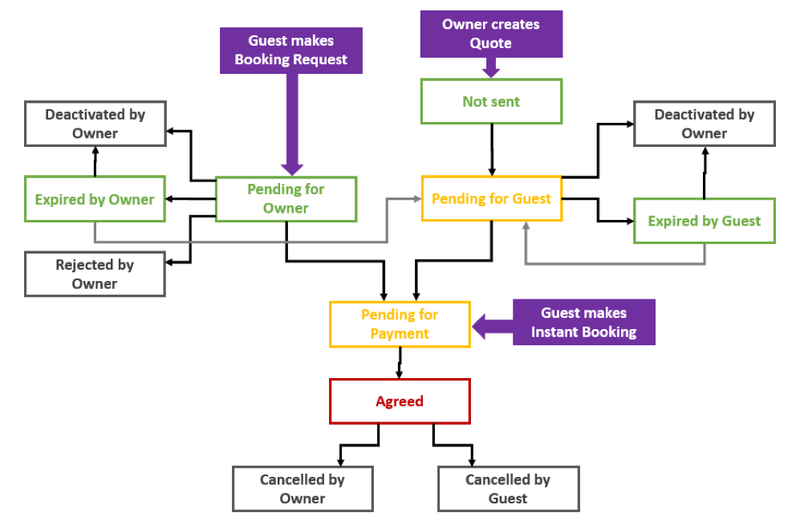 The reason why a booking has a specific status: e.g. the booking is Declined because it was Cancelled by Guest. Important: your calendar gets blocked every time the Quote status and the Booking status change from green to amber or red. You should request and receive a payment for those bookings as soon as possible. When sending the booking to your guest, the Quote status changes to Pending for Guest and the Booking status to Tentative. Your calendar is blocked. The only possible action after the booking is confirmed is that one of the two parties cancels it. See How to cancel a booking and issue a refund. The guest makes a Booking Request. The Quote status changes to Pending for Owner, while the booking status stays Open. Your calendar is not yet blocked. Does not confirm the booking request within one week. The booking expires and the booking path ends here. The only possible action after the booking is confirmed is that one of the two parties cancels it, see Cancel a booking. 💡 Note: Find out more about possible settings in our Use cases for booking requests. The guest makes an online booking. The quote status shows Agreed and the booking status shows Booked. Your calendar is blocked.